There are many fan theories floating around about movies from our youth, whether it be the Pixar Theory, that Tangled, The Little Mermaid, Frozen and Tarzan are all interconnected, or even the fact that the merchant at the beginning of the movie Aladdin was meant to be the Genie after he was set free? Theories abound in the Disney universe for nearly every movie in their animated vault. But what about those animated movies that don't fall under the Disney umbrella? 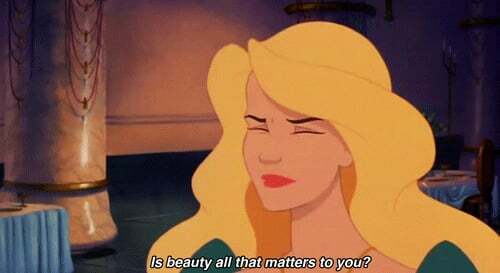 The Swan Princess was released by Turner Home Entertainment 1994, and is one of the less popular princess movies that were following the Disney formula at the time. However, it is charming and still one of my favorite cartoons, despite all of it its flaws. Rewatching it recently, one of the more popular songs from the soundtrack gave me an idea. Fittingly, it's called "This is My Idea" and my thought was that perhaps Odette was protesting just a little too much when she said that she wasn't into the idea of being with Prince Derek. It was there under our noses all along, right in the song itself. The scene in which the song plays is a montage, one that shows them growing up together through their childhood and into adulthood, giving us glimpses of their lives as well as their thought processes in a clever way. Shall we dive in? that she shows displeasure, which, given that he is basically insulting her by not being kind is not a surprise. That can hurt a young girl's ego after all! So, though their first meeting didn't go all that well, it was never Odette who disliked Derek in the first place. It was Derek who planted that seed. Even as they grow older, Derek and his friend complain about her, and while she isn't completely excited to be making the visit, she is making the effort. They are literally running from her and telling her they don't care about her feelings, while she is chasing him down and wanting to play. At that age young girls would want the attention of the boy they like, but being ignored or to "Keep Out" is not really fun. She isn't deterred, though. As she gets older Derek mentions that she tries to get him to play "dress-up" with her, a game usually reserved for much younger children. She wants to include him in her games, even though in the past he had excluded her. She also makes a point to flirt with guards directly in front of him, perhaps to make him a little jealous and see that she is someone to be desired? One thing to note especially is that she is still wearing the necklace he had gifted her as a baby. If she didn't care for him at all, why would she wear something that is very sentimental and important, representing the pact between the two of them as well as their kingdoms? And can we talk about this coquettish look right here? This is a girl who is looking at what she wants and knows what she wants — and in this case, what she's looking at is Derek. It's a teenage version of the "come hither" look that women use to seduce men, and as they are playing a game together at the end of this verse (in the song's montage) she states that "This is my idea of fun." It could be that she had won the game, or that she thought he was finally warming up to her. Once it is their final meeting in the song it is clear that Odette is fed up. Derek flat out states, "I can do much better I am sure," which makes it clear he believes he can find someone better than Odette. However, Odette simply states that he's "immature" which is undoubtedly how he had been acting towards her. All of this can point toward the fact that she did, in fact, have feelings for him their entire lives. The whole time he was being mean, in fact, which then does justify her being upset when she questions him on his intentions after he says to arrange the marriage. While it may just be me overthinking the movie, I think it adds another layer to Odette. Even as a kid I didn't quite understand how she could be so upset with Derek if she didn't even like him until they were adults. But thinking of it in terms of this song, and believing that she had feelings for him all along suddenly makes her reactions more understandable.